Home Gallery Small Sampling of Stock Resin Wicker from C.I. Inc.
Why wait 4 to 6 weeks for your furniture . Visit our showroom today and be sitting in your new outdoor furniture tomorrow. 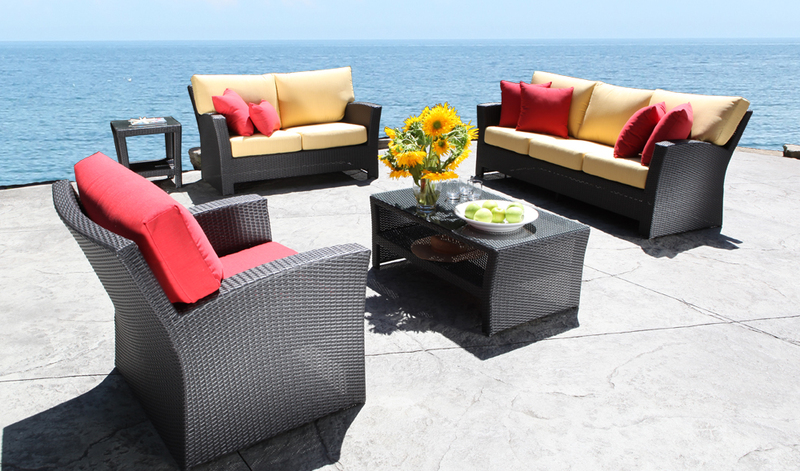 Ontario's Largest stock of top quality outdoor wicker . Heaviest aluminum frames wrapped with the highest grade extruded wicker will ensure your purchase will far out last anything bought from a big box store or a club warehouse online website. Choose from 30 sunbrella fabrics that are stocked on the roll in our sewing facility. We also support and back up all manufacturer warranties . How often and for what purposes do you use your patio? Do you entertain frequently or spend a considerable amount of time in your backyard? Do you have many weekend parties or holiday guests? How many people do you normally have around your patio table? What is the size of your deck? Which shape of patio table is more suitable for your backyard, a round patio table or rectangle outdoor dining table? Would an outdoor sectional make the best use of your backyard space? Is it preferable to choose a deep seating set instead of a dining set? 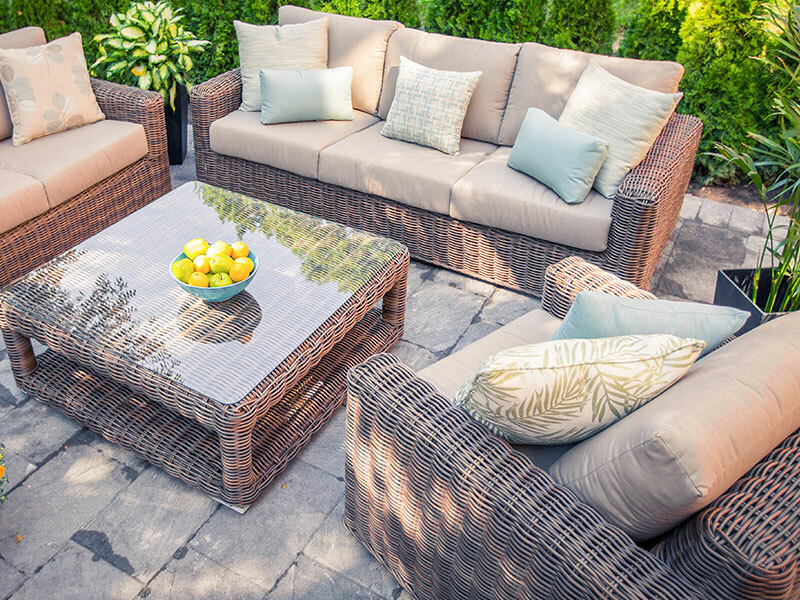 Patio furniture can be classified into 2 categories: outdoor dining sets (including patio bars) and outdoor conversation sets (with extras like outdoor daybeds and poufs). Most people love the outdoors, whether it's relaxing in the sun on a lounger with a good book, or enjoying a nice romantic dinner under the stars. In recent years, outdoor conversation sets have become increasingly popular as the backyard becomes an extension of the home. And there are now more offerings to reflect this, with popular options like outdoor fire pits surrounded by comfortable deep seating chairs, big round and square shaped sectionals, and even fun outdoor daybeds. When it's warm outside, it's hard to think of anything better than sitting beside the pool and soaking up some sun. And a cool night is the perfect time to sit around a fire pit table, watching the fire dance, and enjoying some light conversation. Another new option is the extendable patio table which can sit 6-8 people or 10 to 12 people when extended. Extendable tables offer more flexibility and provide better use of your space. For those with a cottage or country style home, we recommend keeping with your surroundings and going with a more traditional design while more modern patio furniture looks great on a condo balcony or house in an area like downtown Toronto. The simple design and clean lines of contemporary style furniture continues to be on trend with many residential and commercial clients. When buying patio furniture, be sure to also keep in mind the color of your deck and walls when choosing patio furniture finishes, outdoor cushions, pillows, and patio umbrellas. High end wicker patio furniture is hand made by weaving the outdoor wicker onto a powder coated aluminum frame. This kind of manufacturing technique allows for a softer feel and warmer look, making high end wicker patio furniture the preferable choice. Choosing patio furniture with a thicker and wider wicker gives it a feeling of being stronger and more substantial while providing a high-class look that is gradually replacing the thinner wickers. One concern people have is about using the furniture beside a pool or ocean. Some other materials can have problems with surface oxidation and peeling but with wicker there is nothing to worry about as long as you use high end wicker patio furniture. Cast aluminum patio furniture is quickly becoming the popular choice especially in areas where there is a pool, as there is no need to worry about the glass on the dining table or coffee and side tables shattering or breaking. Cast aluminum is strong but also looks strong which will only add to its high end look. The smooth surface of aluminum also lend to a more formal look. The unique technique used to manufacture cast aluminum patio furniture allows the manufacturer to be creative in its designs. Cast aluminum tables can be full of beautiful details and intricate designs to create many types of looks from traditional to modern. Cast aluminum does have the down fall of being quite heavy and expensive. And while heavy is good, too much is not, especially on a dining chair people need to move to get in and out from the table. This is why many cast aluminum chairs also use tubular aluminum which is much lighter. By using the beautiful designs of the cast in the back and seat areas and using the tubular aluminum on the legs and arms this allows for a great looking chair that is less heavy and also less expensive. The table tops materials of outdoor fire pits can be sorted into tile, granite, fiberglass, concrete, and aluminum. Tile tops are not very durable and are known to fall off after only a year, so few factories continue to use this material. While granite tops are a popular choice since they give a luxury look to your fire pit they do come with their problems. When heated, the granite around the burner area warms and when it meets with the colder outside perimeter it has a tendency to crack for this reason many factories are turning to other more durable materials. While fiberglass tops have nothing wrong with them, it tends to look inexpensive and therefore not suitable for higher end styles of outdoor fire pits. Concrete is a new material that manufacturers are starting to be experiment with for outdoor fire pits. When it comes to what is the most popular materials for making outdoor fire pit tops, cast aluminum is the answer. Cast aluminum can be made into many shapes while maintaining its strength due to the special manufacturing technique. This is why cast aluminum is not only used for tops but bases as well including the bases when other materials are used for the tops. 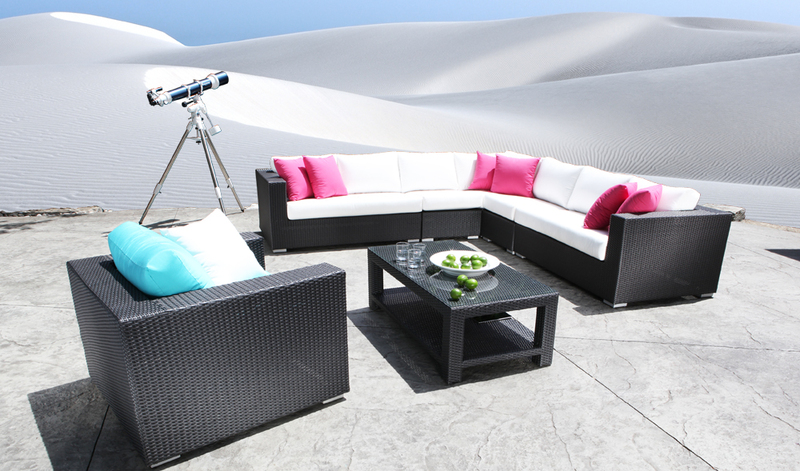 The most obvious advantage of outdoor sectionals is they can be put together into many configurations and sizes including round, curved, square, and rectangle shaped sets. 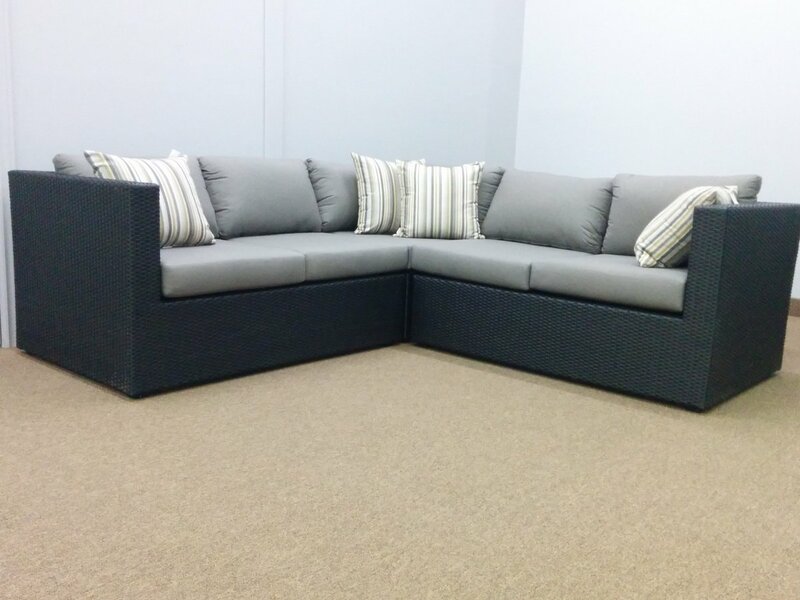 Sectional options also include wicker sectionals, cast aluminum sectionals, and stainless steel sectionals. Sectionals are made up of many different modules, including left and right modules, slipper chairs and corners that can all be piece together to create the arrangement that is right for you. Keep in mind when choosing the corner module that 45° corner modules allow a person to be able to sit in the corner spot while 90° corner modules do not, however the 90° corner modules does make the best use of space. When deciding on your configuration make sure to double check your measurements to see if you have room for that extra slipper chair you want. Outdoor bars are a great choice to liven up you patio. When looking for wicker outdoor bar stools make sure to look at the foot rest area, this spot receives a lot of wear and tear especially when used in a commercial setting. Therefore it is best to choose a stool that does not have any wicker weaving in that spot. Cast aluminum outdoor bar stools are another great choice, and because they are made of aluminum, the foot rest area is very durable. However since cast aluminum is a harder material it is a good idea to use outdoor cushions to increase the comfort level. Outdoor wicker is most often chosen for the deep seating area however outdoor wicker dining chairs are also a great option. The backs of outdoor wicker dining chairs are fully solid which creates a very comfortable sitting experience. The most popular choice for dining is cast aluminum patio chairs. Cast aluminum allows for a vast array of styles and also provides a more formal look. Stainless steel chairs are prefect for when a modern luxury look is desired. Highly polished stainless steel is beautiful and the low heat transfer rate makes it a great choice for sitting out in the sun. Teak patio chairs provide a nice heavy look and natural feel helping to blend your furniture in with your surroundings. Patio Tablesis a great material for any style table whether you choose a dining table, fire pit table, pedestal table or extending patio table. Stainless steel patio tables are very modern and will make a bold statement in your backyard design. Teak patio tables will provide a natural look and feel however they do require yearly maintenance to keep them looking their best. One popular feature to look for in umbrellas is whether it is able to tilt which helps to maximize the shade coverage. The round 7' umbrella has a button tilt while the 9' and 11' umbrellas have auto tilt. 10' square and 8*11' patio umbrellas are not able to tilt due to their size. Auto tilt works once the umbrella is fully open by continuing to use the crank to start the tilt feature. Button tilt works by pushing in a button to tilt the umbrella. Since commercial patio umbrellas are used on a more frequent basis they need to be very durable. The owner of the establishment also does not want the clientele tampering with the umbrella and so they are made with that in mind. Therefore the 7'ft and 9'ft Commercial Patio Umbrellas do not tilt and also do not have a crank; instead they are secured in the open position by a pin lock. The umbrella poles are also design to be one solid piece. There are many styles of patio tables with the 2 main materials being outdoor wicker and aluminum. Both have their benefits, and while wicker tables provide a soft and casual feel, the glass top is not always preferable especially in areas where there is a pool nearby. Some newer styles use outdoor wicker legs and frame combined with an aluminum top. This design not only solves the problem of the glass but also creates a very fashionable look while allowing people the choice of outdoor wicker or aluminum for the chairs. When shopping for a high end cantilever patio umbrella, look for one that comes with wheels and can rotate 360°, this will make it much easier for you to move around depending on where the sun is. Also a good idea is one where you can adjust the angle of the canopy to provide maximum shade coverage. Once you know which umbrella is best suited for you, you can decide on a fabric color to compliment your patio furniture cushions. When buying an extendable patio table, always make sure that the table is easy to open and close. If a guest pops over you want to be able to quickly accommodate them and not spend a lot of time trying to adjust the table. It is also important to consider how and where the additional panels are stored. The best option is to have ones that are self-storing as this allows them to be readily available. It is also nice to have 2 panels so you can extend the table only a small amount if that is all that is required. Also when there are 2 panels it allows for a middle stationary piece that can accommodate an umbrella. By having this stationary piece you will not need to remove the umbrella just to extend the table. Some things to keep in mind when choosing your outdoor patio cushions are the fabric and the foam. The higher the density of cushion foam, the longer it will keep its shape. As a frame of reference 1.9 density is the highest level for indoor sofa cushion foam and so something in this range would also be suitable for your outdoor patio cushions as well. For places where there is a lot of rain, choosing quick dry cushions would be a smart choice. CabanaCoast Quick Dry Foam is high quality with a density of 2.2. When looking for fabric, make sure to pick one that is made for the outdoors and is UV and mildew resistant. When deciding on the color of your outdoor cushions try to pick one that is not too close to the color of patio furniture frames. Keep in mind the look you are going for as well, you can pick more neutral colors for a high end luxury look or some bright bold colors to keep it fun and casual. outdoor pillows are a great way to experiment with color with the commitment. And as usual, don't forget your landscape and exterior wall colors too. 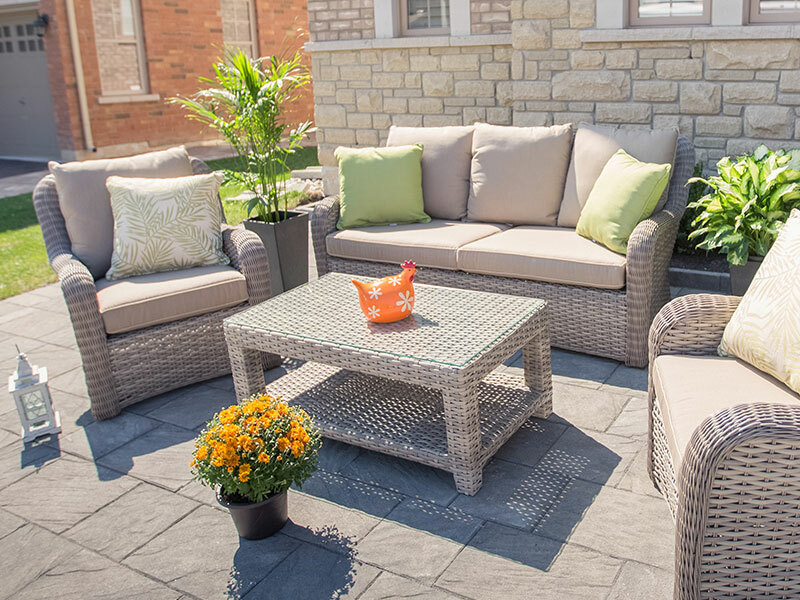 if you want to find out more about our patio furniture and patio cushions, visit our website where you will find the handy Customizable Patio Cushions feature. It allows you to see what the fabrics will look like on each of our collections. With any investment it always best to be gain as much information and be as prepared as possible before making the final decision. We hope this has helped you in your search for finding the best patio furniture for your home.